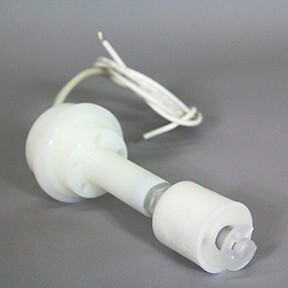 The Standard Level Sensor Cap Assembly is the insert with five ports used with the Waste Bottle Ring Cap to connect the waste bottle to the Liberty Blue using the Waste Tubing Bundle. The Waste Level Sensor is integrated into this insert. NOTE: The Standard Level Sensor Cap Assembly is not compatible with the 20 L Waste Option. The Extened Level Sensor Cap Assembly (PN 551175) should be used with the 20 L waste option.